If you're looking for a way to make a quick $6,650, you might want to consider hanging out at rugby games, pouring beer on players and insulting their mothers. It worked for the idiot pictured above in the Santa hat. Of course, it also got the player, Trevor Brennan, banned for life by the European Rugby Cup. Brennan went into the stands and slugged the guy in the face. It cost him not only the lifetime ban (which he cleverly beat by retiring first), but also about $40,000. He was fined $33,250, and had to give the fan $6,650. Rugby officials first became suspicious that the Brennan had violent and erratic tendencies when they discovered that he was a rugby player. Brennan did later apologize, but I didn't sense a lot of sincerity in his apology. The lifetime ban seems a little harsh to me. 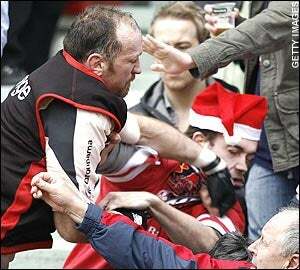 Of course, Brennan was in the wrong, and you can't punch fans, but come on, the guy's a rugby player. We have to take that into consideration right? He's got a higher degree of difficulty in trying to not punch people in the face. Sure, he was wrong, and he deserves to be punished. But I don't know... it's hard to judge, because this sort of thing could never happen in America, and if it did, that player certainly wouldn't be back on the court the next year before being traded to the Sacramento Kings and not feeding his dogs.